Thank you so much for your book. I read it all today and found it fascinating. You must have spent SO much time researching this. Even though people might not have cancer, I’m sure they can make GREAT benefits from reading this, and making changes to unhealthy lifestyle!!!!!! I wish that everyone could have a copy of your book, ‘Do You Want to Know What We Did to Beat Cancer?’ The measures you took are not only relevant to prevent cancer but highly effective for people with cancer and also other auto immune illnesses as well. The information I believe can also help to promote good health in general. Reading your book is great for me as we are on the same page and we have been on a very similar journey, stumbling across the same life changing information. You have written it in a wonderful way that lets the reader into our/your journey and gets the message through in an understandable way. Keep speaking your truth. Some people are not ready for it, but all you can do is your best and to share with them. “I already know how much an industry cancer is, mainly benefiting the drug corporations, not promoting the good health & nutrition that has been known for decades and is freely available, without costly drugs or treatments. 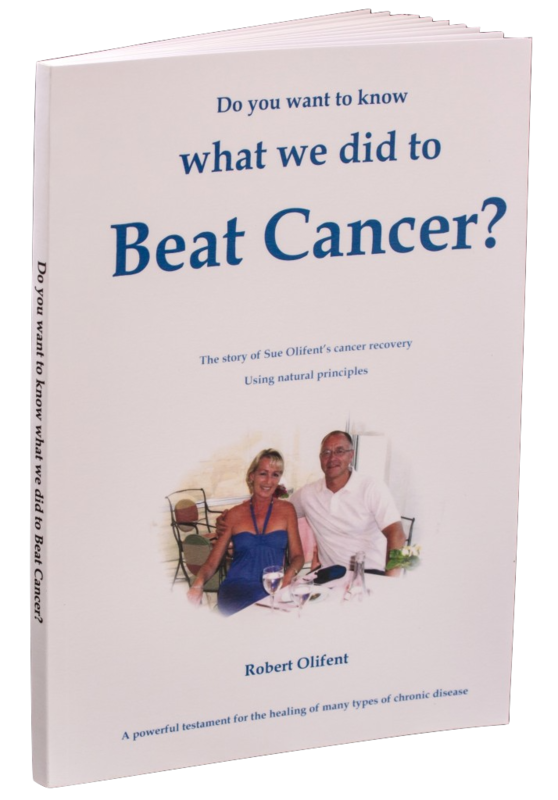 I have been at a number of Robert & Sue’s talks and have been inspired by Sue and others sharing their experiences, how they have determinedly managed and beaten cancer, often when the NHS gave them little or no chance of survival!